The problem: They have way too many funds, but not enough diversification. Tony and Liz Aquino of Springfield, Va., with their children A.J. and Annabelle. 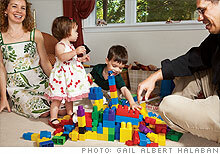 (Money Magazine) -- The Aquinos live by a simple rule: "If we can't pay for something, we don't buy it," says Liz, 34. In the eight years she and Tony, 36, a systems engineer, have been married, the couple have socked away more than $400,000. Their goal is a comfortable retirement for themselves and college for little ones A.J., 3, and Annabelle, 1, while still allowing Liz, a former school-teacher, to stay home with the kids. But although they have the saving side of the equation in order, their investment plan is in disarray. It's not that the couple got off to a slow start. They just never decided on a game plan. Instead, the Aquinos read stories about hot funds and grabbed them up. As a result, they are now sitting on a hodgepodge of more than five dozen once-popular funds, many of which own the same stocks. With so many holdings, says Liz, "it's difficult to keep track of whether our portfolio is too heavy in one sector or if we have an appropriate mix." 1. Diversify their strategy. This couple can afford to be aggressive, keeping 80% of their money in stocks and 20% in bonds, says planner Gordon Bernhardt of McLean, Va. But they need to boost their stake in small-cap funds and foreign holdings. 2. Trim their portfolio. The Aquinos are in 62 funds, 18 of which own GE shares. They can pare that list to about a dozen by selling high-cost holdings and funds sitting on losses. The planner also suggests replacing some holdings with low-cost iShares ETFs, which can be bought through their brokerage. 3. Roll over old 401(k)s. To further simplify, the Aquinos should roll over Tony's old 401(k)s into an IRA. That will also give them better fund choices. Want a Money Makeover? E-mail us at makeover@moneymail.com. Can you afford a career switch?